Bumble and bumble. 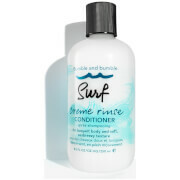 Surf creme rinse CONDITIONER 250ml, a hair conditioner that provides fresh hydration for all hair types. Designed to impart airy softness and texture, this conditioning blend detangles with minerals and sea botanicals, creating buoyant, breezy waves. If natural-looking body and texture is what you want, then this enhancing conditioner is what you need. Smooth through wet hair after using the Bumble and bumble Surf Foam Wash Shampoo. Leave for a minute or two, then rinse away thoroughly. Mist the Surf Spray through damp hair and air dry for soft, beachy waves. Bumble and bumble. 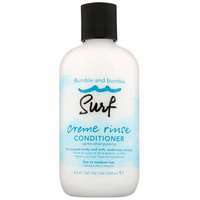 Surf creme rinse CONDITIONER 250ml was found on 8 websites and was price compared using EAN: 0685428016569. The cheapest Bumble and bumble. Surf creme rinse CONDITIONER 250ml is shown as the main item, prices range from £14.90 to £24.00, excluding delivery. Price comparison based on price and delivery charges, with any valid discount codes being applied, is shown in the table above. Prices and information correct at the time of publication.